If you enjoy repeating yourself, the Triple will have you appreciating delay in a new light. Huge array of inspiring delay possibilities. Excellent sound quality. Price. Easy to lose track of controls. 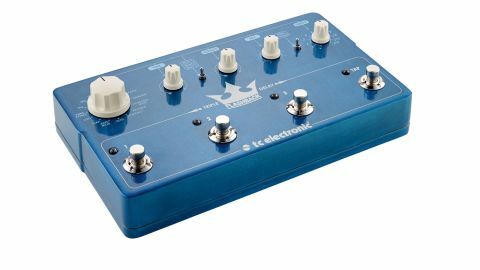 Flash back to early 2011, and TC Electronic was just unleashing its now-signature delay pedal on unsuspecting guitarists - the combination of classic delay types, pristine audio quality and downloadable TonePrint presets made it an instant hit. Now, five incarnations later, the Triple Delay goes where no Flashback has gone before, allowing you to run three delays at once. The Flashback Triple Delay features three separate delay engines, activated via individual footswitches - you select one of three delays for adjustment using a toggle switch, while a tap tempo footswitch allows you to input the delay time for the selected delay. "The resultant rhythms can inspire entire songs with just a handful of notes"
The Triple's trump card is the serial/parallel switch: parallel sends your signal to all delays at once for defined rhythmic repeats, series sends your signal to delay one, then two, then three, which results in huge, cascading echoes. Why run multiple delays at once? Aside from the obvious post-rock potential, Joe Satriani runs two delays for reverb-like ambience, while Brian May uses several at once for self- harmonising. Then, of course, there are Edge-style syncopated repeats - and that's something of a speciality for the Triple Delay. The detailed subdivision knob - a mere toggle switch on previous Flashbacks - allows you to dial in rhythms for each delay. The delay sounds are as brilliant as ever, but the ability to run three at once opens up new realms of sonic exploration. Dial in a basic eighth note, and combine it with a dotted eighth and triplets, and you have a guitar symphony in parallel mode - or switch over to serial for a wall of sound that's ripe for tremolo picking. It's easy to get lost in the minutiae of delay time adjustment - the resultant rhythms can inspire entire songs with just a handful of notes, especially when you dial in the dreamy modulated Space and 2290 Mod settings. With three delays to keep track of, it's easy to get lost in the Triple's controls; you may find yourself activating delay one, but forgetting to switch the control toggle over, thus losing your carefully programmed settings for another delay while wondering why your current sound isn't changing. Similarly, the tap tempo LED flashes in time only with the toggle-selected delay, not what's active. As much as we love TC's keep-it-simple philosophy, we can't help but feel a few more controls, or even a screen, could help here. The latest entry in the Flashback line retains the effect's much-lauded sound quality, but it's also the most involved yet, and requires a fair amount of knob twiddling to implement it into your playing. Our main concern is the price: at £66 more than the X4 - which also includes a looper - only the most hardened echo nuts will opt for this over its keener-priced brother.